Travis took over as President of Stokes Capital Partners in December 2014. As President, Travis has led the company in growing and managing its portfolio through development and acquisition. Travis was the lead or managing partner in the development of the Vivint Logan Campus, Inovar facility, acquisition of office buildings in Utah State’s Innovation Campus, acquisition of non-preforming loans, and serves as the managing partner for the Woodbury/Stokes managed portfolio in Cache Valley. Travis has been able to lead the growth of the company through strategic partnerships and takes an active role in all aspects of development and acquisition from lease negotiations to management. As a result of his background from Woodbury Corporation, he has specialized in working with the State of Utah, Federal Government, and local municipalities in creating win-win opportunities for Public-Private-Partnerships. Travis is a Managing Partner of OZ Impact Funds. An Opportunity Fund specializing in transforming communities and developing local economies in underserved markets throughout the United States. In addition, Travis is a General Partner in SLC Port - Global Logistics Center, which is a 3,000-acre development in Salt Lake City’s Northwest Quadrant. 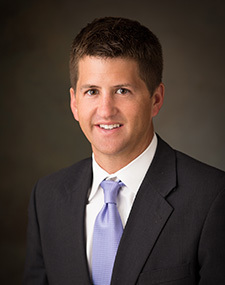 Travis has served on the Utah State University Foundation Board since October 2015. His current role on the board is Vice-Chair and he serves on the Executive Committee. His roles on the board have included strategic partnerships and gifting for special building projects, working with the University President and Executive team to grow recruitment, enhance internship opportunities for students, and fundraising for and establishing the Latino Student Success Center and Veterans Scholarship Fund. Real Estate Advisor to the Board – Lee’s Marketplace Inc.
Travis has been an advisor to the board for Lee’s Marketplace Inc. since December 2015. As an advisor to the board, Travis has assisted Lee’s Marketplace, Inc. in the acquisition of the former Day’s Market Grocery Store in Heber, which now operates as Lee’s Marketplace. He has also been instrumental in their new store in Foxboro (North Salt Lake). Travis has worked as a real estate advisor to the Young Family, and the Young Automotive group beginning in October 2016. Travis is responsible for site acquisitions, entitlements, and negotiation of sales tax incentives and or other municipal incentives for their new auto-dealerships. Travis worked as a Senior Project Manager running the largest Enhanced Use Lease in the Department of Defense at Hill Air Force Base, the 550-acre Falcon Hill - National Aerospace Research Park. Travis negotiated successful leases with Northrop Grumman, BAE, Lockheed Martin, Boeing, and ATK. He was also responsible for working with and helping create MIDA (a State Authority responsible for the municipal approvals and governance of Falcon Hill). In addition to MIDA Travis specialized in working with the State of Utah Congressional Delegation, and Utah State Legislature. The efforts of the team led to State support and funding of critical project infrastructure, and Air Force facilities. Travis also led acquisitional and development efforts of the portfolio at Utah State University’s Innovation Campus. He managed the creation and negotiation of ground leases with Utah State, leasing efforts with Space Dynamics Laboratory, and financial analysis of projects.